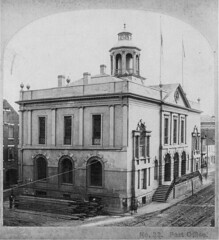 Colonial Exchange and Customs House. Charleston, SC. Photo taken between c.1865, just after the city's surrender and Union troops began their occupation, and c. 1880, not long before the Great Charleston Earthquake of 1886. The building served as both the US and Confederate Post Office. John Horlbeck, a master builder and brick manufacturer, is generally credited with the construction of what is considered to have been one of the finest public buildings to have been constructed in the British colonies up to that time. The original dome or cupola was replaced just over 50 years after the original which leaked. Charles Fraser, a local artist of note, designed the replacement shown here.